A Q&A with IPStar spokesman John Humphrey. Is IPStar looking into digital satellite radio for this part of the world? No, not to my knowledge at least. The current IPSTAR-1 satellite is not designed for Satellite Digital Audio Radio Service (S-DARS). The service requires a dedicated number of one-way transponders usually operating in S-band (US) or L-band (Europe). The transponders have to be reasonably high powered to provide connectivity to the small antennas used in cars or to the internal antennas in devices. IPSTAR was designed for two-way Internet access into 50 cm + antennas. Has Shin done any digital satellite radio services in Asia yet? Are these services hard to provide? As above, requires a purpose designed and built satellite. It also requires coordination with terrestrial spectrum users so that ground based services cannot operate in the same frequencies (which would cause interference). Do you think there'd be a market for them in a place like New Zealand? We are so far away from the large concentrations of population (Asia, Europe & US) that designing a bird with coverage extending to NZ would not traditionally have the economics required. However, who knows in the future with advances in satellite capacity per build dollar (such as IPSTAR-1) but my guess is that such a business case will be tenuous for some time. I am sure if it could be provided there would be a sizeable market in NZ. You only have to look at the figures for the US. Q&A with Altec Lansing senior vice president of sales and marketing, Robert Heiblim. Does Altec Lansing have speakers designed specifically for digital satellite radio players (either in-car or portable models) in the market in other parts of the world? Altec Lansing's speaker systems for satellite radio currently are limited to the U.S. and Canada markets. We have partnered with one of the leading services in this industry. Through this partnership, we have been educated about the market and user needs, and we will assess each opportunity moving forward based on the market and user needs. What does Altec Lansing see as the appeal in the technology? Aren't most people well serviced by existing terrestrial radio services? 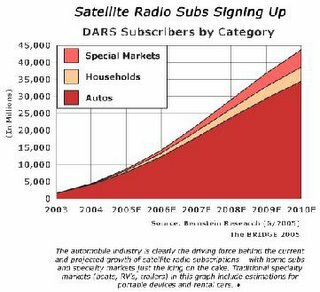 Satellite radio plays a different role than local terrestrial broadcast. Local broadcasting provides listeners with local news, weather, traffic, ads and other regional matters they need. Satellite radio focuses more on entertaining listeners. The appeals in satellite radio are the quality of sound that comes with digital audio, the variety of program content and the fact that you can access the same content no matter where you are located. Altec Lansing and XM Satellite radio have a similar approach to product development: we aim to provide a sound enhancement solution to the digital audio market, and we give users a wide variety of listening experiences to match their lifestyle needs. Consumers appreciate the freedom of choice. How important a market is digital satellite radio to Altec Lansing? Does the company project big growth in this market in 2006? Our speaker systems for XM Satellite Radio fall under our on-the-go, versatile speaker and digital home audio speaker categories. These were our top-selling categories in 2005. We expect our satellite radio speaker systems to take up a larger share of these categories in 2006. If other digital radio satellite services come to market, will the existing Altec Lansing digital satellite radio player speakers be able to work with them or are they XM Radio specific? Although our speaker systems for satellite radio are XM specific, they all contain an auxiliary jack for connection to other portable digital audio devices. Graphics from reports by Vintage Research and Bernstein Research supplied by John Humphrey.